Priced: $922.25 - $1,085.00 Rated: - 4 stars out of 5 by 1 review. Northern River Supply Alley Cat Cataraft Frame-72Wx88L - NRS Alley Cat Cataraft Frame - A ersatile frame, the NRS Alley Cat frame is perfect for day trips and short overnight adventures on your cataraft. The Alley Cat frame is arranged to carry one cooler or aluminum drybox, either of which double as seats for an extra passenger. At 88" long, it's an ideal fit for a 14' cats, with plenty of room for drybags and other cargo. The modular frame breaks down for easy transport, and LoPro fitting make assembly easy. The NRS Alley Cat cataraft frame also includes a high-back seat, cooler mounts, and adjustable oar mounts. A versatile frame, perfect for day trips and short overnight adventures. The NRS Alley Cat is arranged to carry one cooler or aluminum drybox, both of which double as seats for an extra passenger. At 88" long, it's an ideal fit for a 14' River Cat, with plenty of room for drybags and other cargo. 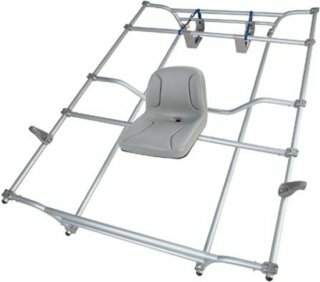 This frame includes a seat bar with a high-back seat, one crossbar and a set of cooler mounts, one footbar, and a set of oar mounts. This Item is Oversized and incurs a Shipper’s Surcharge. Great frame. Perfect for daily & Westwater trips.